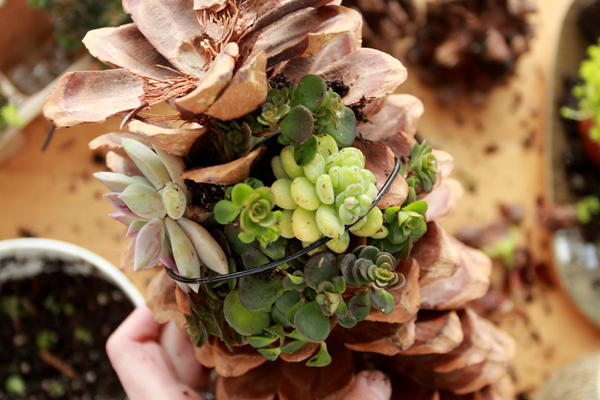 If you want to get your hands dirty before it is time to put seeds in the ground, potting up succulents is a great creative outlet that can be done indoors. 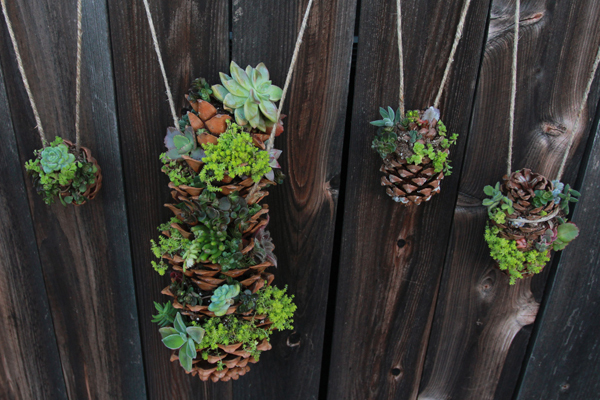 And if you’ve already dabbled with succulent bowls or centerpieces, it’s time to step up your game with these hanging succulent-planted pinecones. 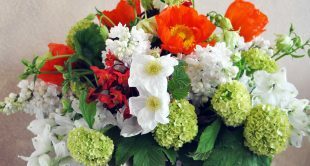 This project combines floral design basics with standard potting techniques. 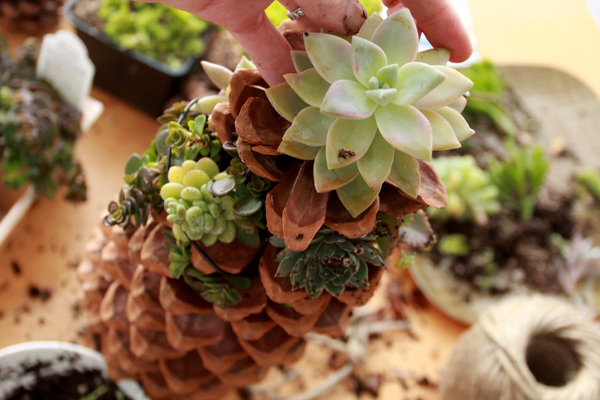 You’ll get to practice gently manipulating plant material while setting it up to thrive and live on in the pine cone. 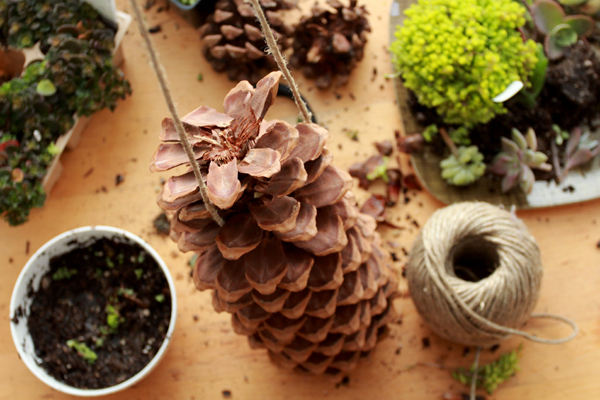 With a few pinecones, succulent 6-packs from your local nursery, a spool of twine, pair of scissors and wire snips, a small spool of craft wire, and some potting soil, you’ll be ready to make your own planted pinecones. 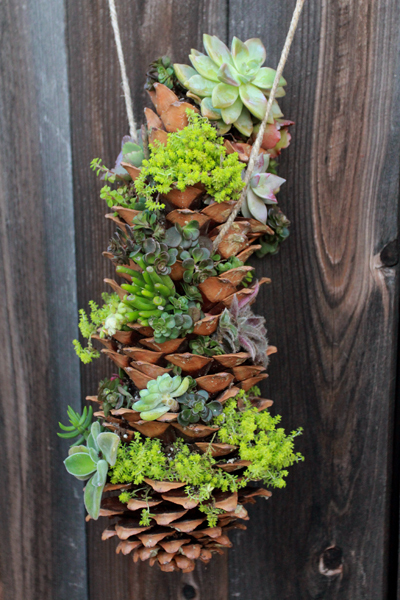 If you have access to succulent clippings from friends and neighbors, they add great variety to this small garden project as well. 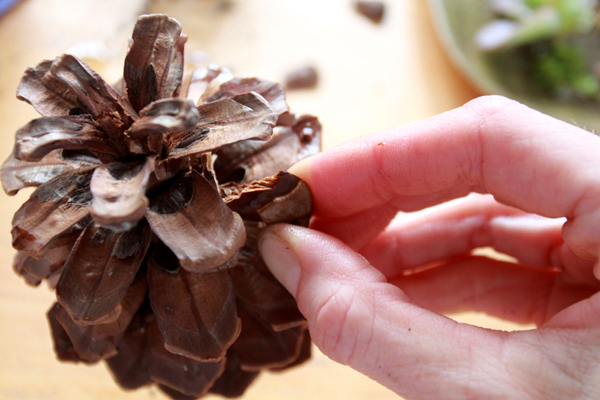 Begin by selecting pinecones that have open scales in at least half of the cone. If you find large pinecones that haven’t yet opened, there are ways to dry them, although open pinecones are easier to work with. 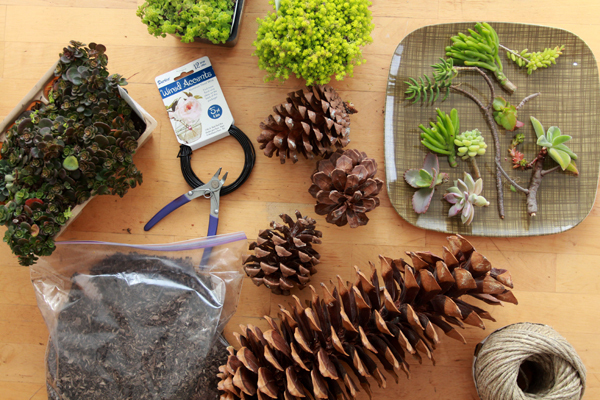 Twist off a few of the pinecone scales with your fingers to make room for succulents, soil and plant roots. 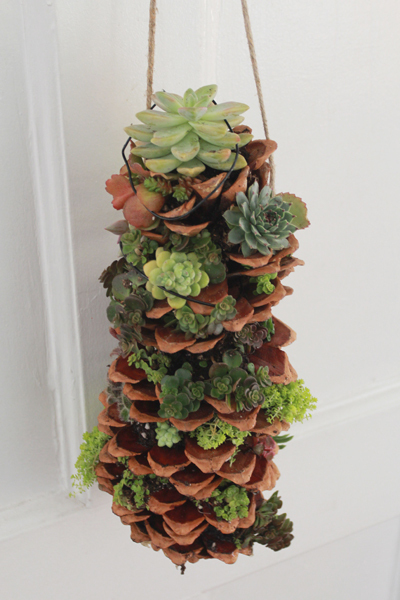 Succulents don’t need a ton of water, but they will dry out quickly if you don’t give them a little room for soil. If you plan on hanging your pinecones, cut a length of twine between 2-3 feet and wrap it around the pinecone, about an inch from the top. Pull the twine taut, and knot it securely. Then tie the loose ends of the twine together in a secure knot. 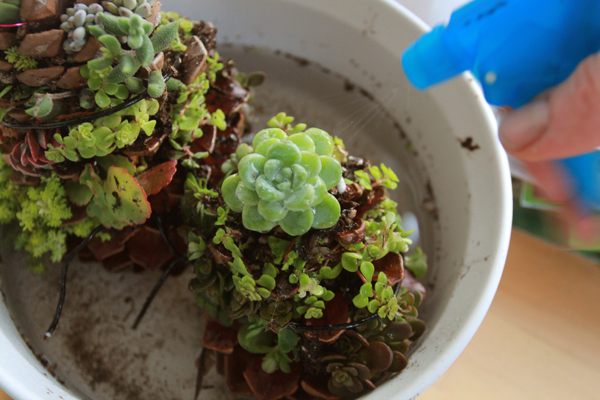 Pluck one of the succulents from your store-bought 6-pack. The soil in a store-bought 6-pack often has a nice network of wispy roots already established, and the soil is typically damp, which is perfect for this project. 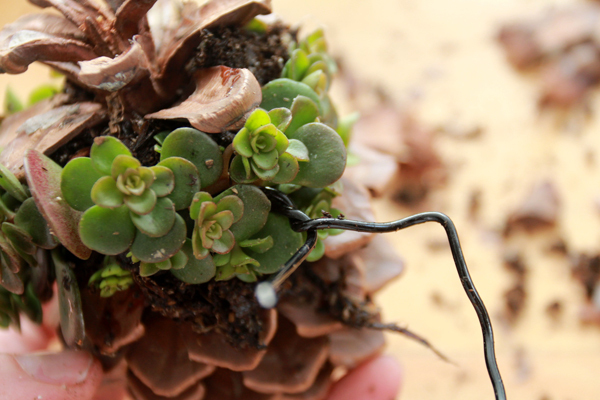 Press the soil into the open nooks of your pinecone, and nestle the attached plant within the scale shelf. 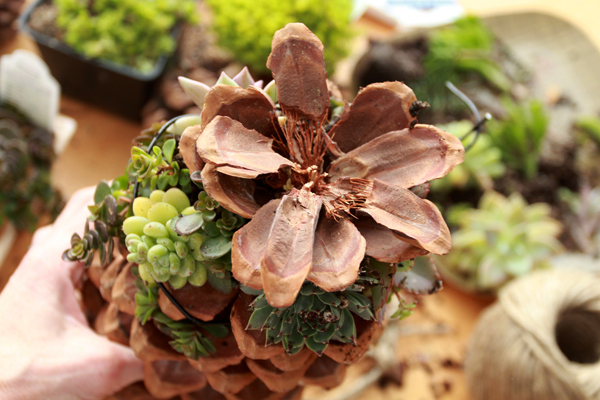 Use a wooden toothpick or pencil to bore a hole into the damp soil, then insert individual succulent clippings to add variation. After planting a couple of the pinecone shelves, cut a length of craft wire and gently wrap it around the plants to help keep them in place. Twist the wire ends together carefully, while the roots knit together. 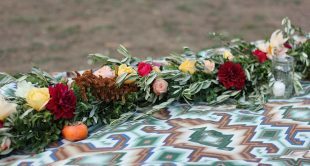 If you have a nice large pinecone you want to use, but it’s missing a top, place a bit of soil in the cupped area and select a succulent with a rosette shape that mimics the pinecone top. Wire the succulent in place and presto! 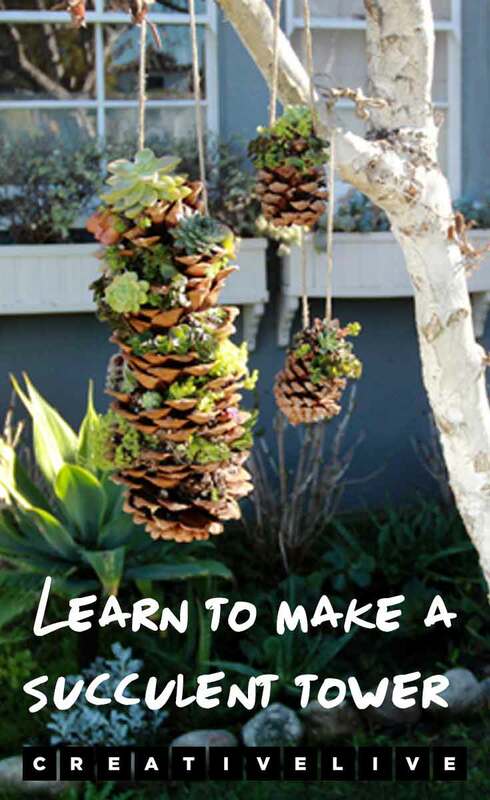 Water them by either partially submerging them in a bowl of water, or giving the entire pinecone several sprays from a water bottle. 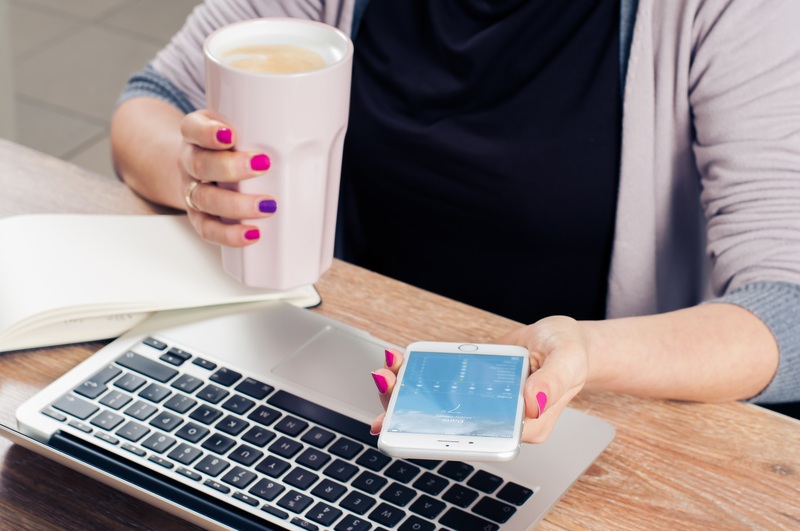 Pitch and sap come with the pinecone territory; so don’t be surprised if your fingers get sticky while you work. Rub a little bit of olive oil in your hands and it will come right off. Chase the oil with some hand soap and you’ll be good to go. 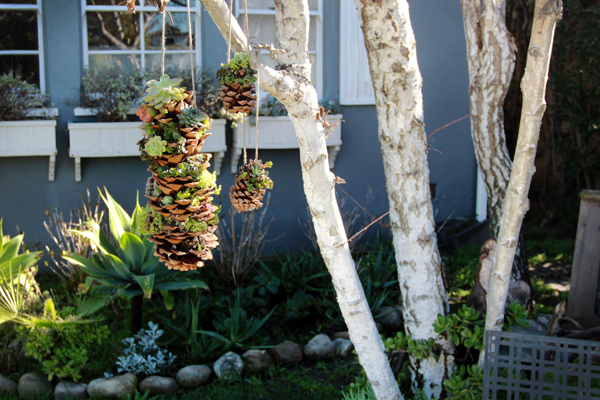 Let your pinecone hang in a bright area within your home, or a wind/rain/snow/animal protected area outside while the plants get established. When your planted pinecones are ready to take outside, or be permanently displayed in your front window, untwist and remove the wire, and enjoy your enchanted pinecone gardens. Not ready to tackle the living thing? 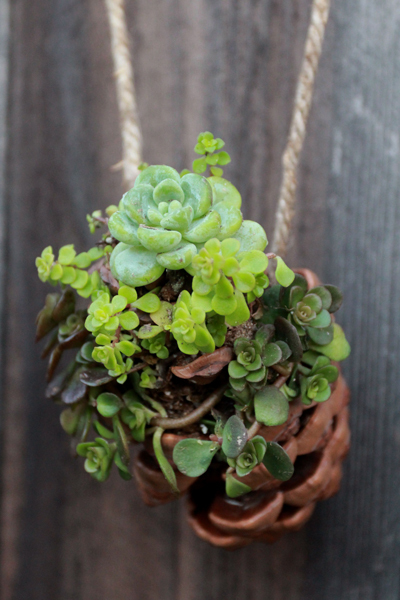 Learn how to make paper succulents with tips from Robert Mahar. Don’t keep this awesome-ness to yourself. Go ahead and Pin it!